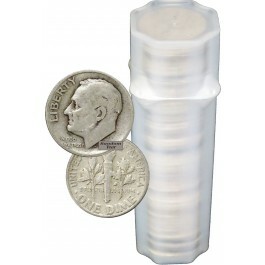 A Roll of 50 mixed & full date 90% silver Roosevelt dimes in average circulated condition. This listing is for ONE roll of 50 pieces. All coins will be packaged in a plastic tube. The Roosevelt Dime is a ten cent piece that was minted in ninety percent silver from 1946-1964 and in copper nickel from 1965 to date. Designed by John R. Sinnock, the inception of the Roosevelt dime started with the death of the 32nd President of the United States Franklin Delano Roosevelt. Soon after his passing, Virginia Congressman Ralph H. Daughton proposed legislation to replace the Mercury Dime with Roosevelt’s image. Chief U.S. Mint Engraver John R. Sinnock was assigned to prepare the new design, and his initial design was rejected. After preparing a new design, it was approved on January 6th, 1946 and on January 30th, 1946 the Roosevelt dime was released on what would have been Roosevelt’s 64th birthday. The obverse features Roosevelt’s bust facing left with Sinnocks initials JS in the truncation of the neck and the date to the right. The reverse depicts a torch, olive branch, and oak branch symbolizing liberty, peace and strength, respectively. The mint mark is found to the left of the torch at the bottom, however starting in 1968, the mint mark was moved to the obverse above the date. Parameters originally set for the Roosevelt Dime struck in silver were: .900 silver, .100 copper composition, a net weight of .07234 oz. pure silver, total weight of 2.5 grams, and featured a 17.9 mm diameter with a reeded edge. However, with the repeal of the gold and silver standard in 1964, the Roosevelt dime was changed to a clad strike and today dimes are .750 copper, .250 nickel composition bonded to an inner core of pure copper. The weight was also reduced to 2.27 grams.